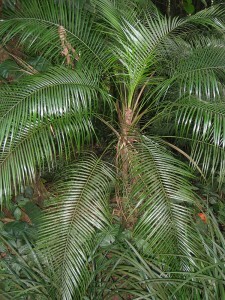 Distribution and habitat: Lytocaryum weddellianum palm originates in South America. It grows naturally in the rainforests of Brazil. 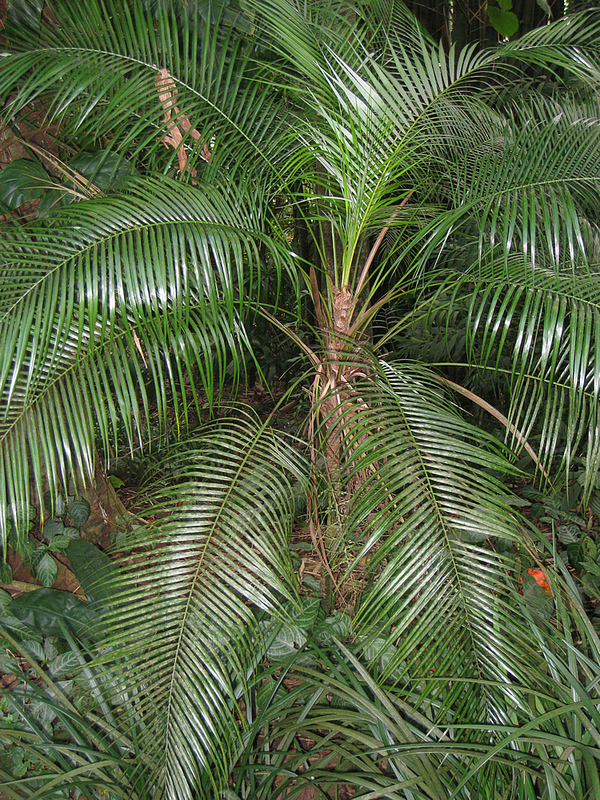 It is a medium altitude palm and it thrives in the humid shade of the Brazilian rainforests. It is closely related to the coconut palm, but is much smaller and more cold tolerant, taking down to about −4°C (25°F). The palm has a small stature, only growing to a height of 1.8m (6 feet). 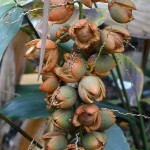 After flowering, it produces small edible fruits that resemble and taste like coconuts. This palm should be grown in well draining soil that is constantly moist, but not soggy, as this can lead to lethal root rot. 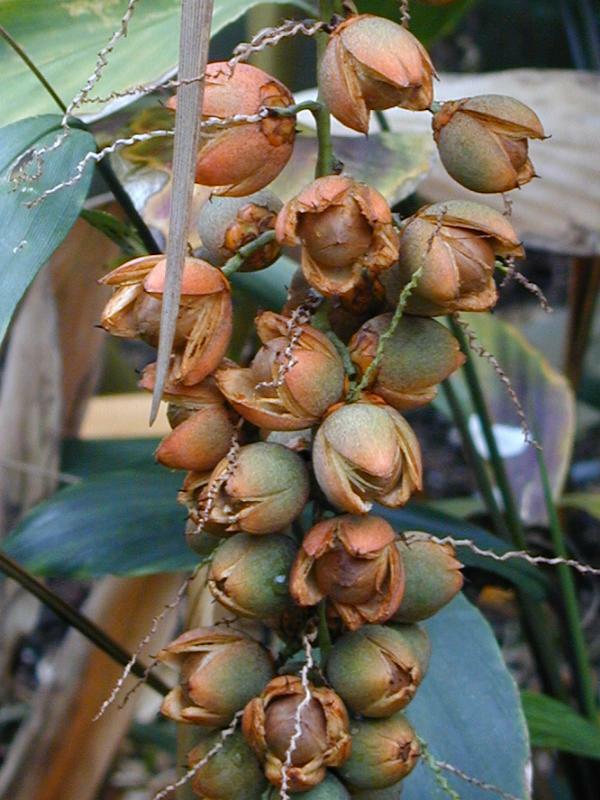 Due to forest destruction and over exploitation by seed collectors the Lytocaryum weddellianum is now considered rare in its native habitat. Description: Lytocaryum weddellianum is commonly used as an indoor palm. It rarely grows grows taller than 1m (3.3 feet) or so, with 60cm (24 inch) spread. Young plant are generally bought when they are only 22-30cm (9-12 inch) high, with three or four 20-25cm (8-10 inch) long fronds. As the plant age, the fronds lengthen and broaden; they can eventually become about 90cm (35 inch) long and 22cm (9 inch) wide. A potted Lytocaryum weddellianum rarely produces a trunk of any length. The shiny, dark green fronds, which are divided into many pinnae (or leaflets) spread out from a very short thickened base. Each frond, carried on a stalk 8-15cm (3-6 inch) long, has a central rib covered with black scales. There are 20 to 30 slender pinnae on each side of the rib and these are evenly arranged – though not quite opposite one another – in herringbone fashion. Flowers are not generally produced indoors. Houseplant care: Lytocaryum weddellianum will live for many years, especially if it is kept in a well-lit position. It is an easy to care palm. Remove any damaged or withered fronds with sharp scissors. An inevitable problem encountered when growing palms indoors is the dust that builds up on the leaves over time that may restrict the amount of light that gets through to the plant. Avoid to use chemicals to shine the palm leaves. The best way to refresh the palm is to wipe the leaves down with damp sponge or stand it outside during a summer shower. Light: Give these palms bright light, but without any direct sunlight. Temperature: Lytocaryum weddellianum do well in temperatures between 15 and 27°C (59-81°F). They should not be exposed for long periods to temperatures below or above that range. They are extremely sensitive to dry air, which will cause the fronds to turn brown and shrivel. Stand the potted plants on trays of moist pebbles throughout the year. Watering: Water moderately at all times, giving enough to make the mixture moist, allowing the top centimetre (0.4 inch) or so to dry out before watering again. When temperatures fall below 15°C (59°F), allow the top 2-3cm (0.8-1 inch) of mixture to dry out between waterings. Lytocaryum weddellianum does not tolerate drought. Fertilising: Apply standard liquid fertiliser about once a month throughout the active growth period. Potting and repotting: Use a soil based potting mixture. It is vitally important not to give these palms larger pots than they actually require. Repotting becomes necessary only when the thickened base of Lytocaryum weddellianum begin to force its way up out of the pot. This will not happen more often than once every two or three years. Repot this palm in spring. Older plants should not be repotted, but top-dressed once a year in spring. Garden Culture: The Lytocaryum weddellianum cannot withstand full sun and needs to be protected by taller growing plants. Propagation: Lytocaryum weddellianum are propagated from seed. This is an extremely slow process and is therefore not recommended for amateur growers. Usually Lytocaryum weddellianum is available throughout the year from garden centres and nurseries. Problems: Most of the diseases of this plant occur when it is either overwatered or not watered enough and if it is getting too much or too little sun.